Come join the Brookline High School wrestling team and coaches for a FREE clinic and intro to the great sport of wrestling. BHS wrestlers and coaches will be conducting a FREE clinic and demonstration of this wonderful sport. The children will be put through a short warm-up and workout. Then your child will learn some basic wrestling rules and apply easy to learn techniques in a safe and fun environment. Our overall goal is to expand the wrestling community in Brookline and advanced a youth wrestling program and the clinic noted here, is just the first of several opportunities for your wrestler this Spring. 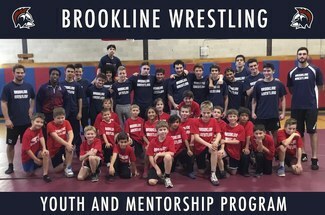 The young wrestlers can continue advancing their skills in a 6 week Brookline recreation program led by the HS coaches and wrestlers, and culminating with the opportunity to compete at the Brookline Spring Scuffle youth wrestling tournament on 5/19/19 at Tappan gym. We look forward to seeing everyone at the clinic and spring events. Go Warriors!